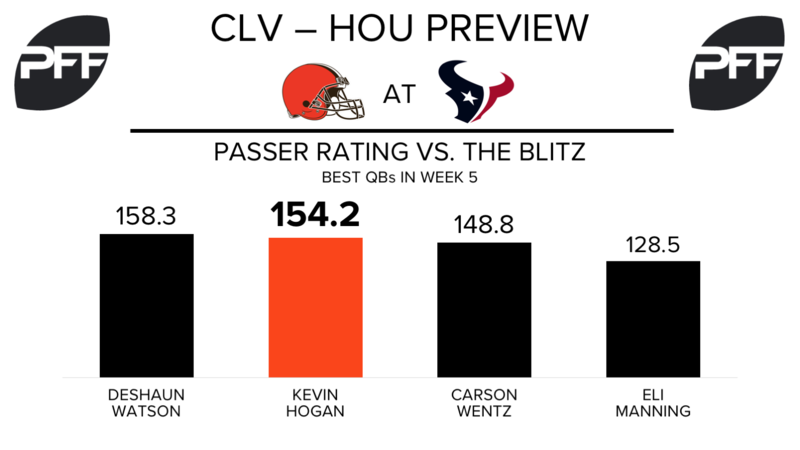 QB Kevin Hogan vs. the blitz — The story to watch for Cleveland’s offense will, of course, be the switch at quarterback from DeShone Kizer to Kevin Hogan. It’s far too early to make any sweeping conclusions about a quarterback with only 116 career snaps, but in limited action this season Hogan has been excellent against the blitz. Only Alex Smith and Drew Brees have a higher passer rating when facing extra rushers than Hogan’s 131.7 mark. The bulk of that success came after stepping in for Kizer last week against the Jets, when he went 8-of-10 for 115 yards and two touchdowns. He’ll get plenty of opportunity to reproduce those efforts this week against a Texans defense that has blitzed opposing passers on 41.6 percent of snaps, the second-highest rate in the league. T Joe Thomas vs. Edge Jadeveon Clowney — Clowney is off to a bit of a slow start compared to what we’ve come to expect from the former No. 1 overall pick. He currently ranks 40th among edge defenders with a 76.6 overall grade, well off the mark he was at last season when he was the seventh-highest graded edge defender (87.8). The primary reason for that drop-off has been his play in the run game. Clowney was an elite run defender last season, with only Michael Bennett and Von Miller earning higher run-defense grades than Clowney’s 91.7 — that’s all the way down to 48.3 (78th) in 2017. Sunday is unlikely to bring much reprieve, as he’ll spend the bulk of his day squaring off against the NFL’s best tackle. Thomas’ 88.9 overall grade paces all tackles after five weeks, with the All-Pro putting in good work in both phases. Despite playing the third-highest number of pass-blocking snaps (231), Thomas is tied for the fifth-fewest quarterback pressures allowed (6). Browns wide receivers vs. Texans secondary — With Corey Coleman out due to injury, the Browns’ top three wideouts — Ricardo Louis, Rashard Higgins and Kenny Britt — have all earned overall grades ranking 100th or worse out of 110 qualifying receivers after five weeks. When targeting non-Corey Coleman wideouts, Browns’ quarterbacks have completed just 48.3 percent of passes with one touchdown and eight interceptions, producing a 33.4 passer rating. If Hogan has any hope of sparking Cleveland’s passing attack, he’s going to need a lot more help from a Browns receiving corps that’s been awful this season. QB Deshaun Watson vs. Edge Myles Garrett– Not surprisingly, Watson’s overall grade continues to climb. In the red (below 60) just two weeks ago, his grade of 70.9 now ranks 27th among quarterbacks. In the past two weeks, Watson has had 37 dropbacks from a clean pocket. His passer rating of 123.9 on those 37 attempts ranks fifth in the league in that span. While the Browns have lead the league in terms of the percentage of plays they blitz, Garrett having a bigger role could change that. In his NFL debut this past Sunday, Garrett was as advertised, playing 19 snaps and getting a sack on his very first pass-rush. With the Texans issues across the offensive line, the blitzing tendencies and Garrett’s presence could lead to Watson relying more on his feet than in past weeks. 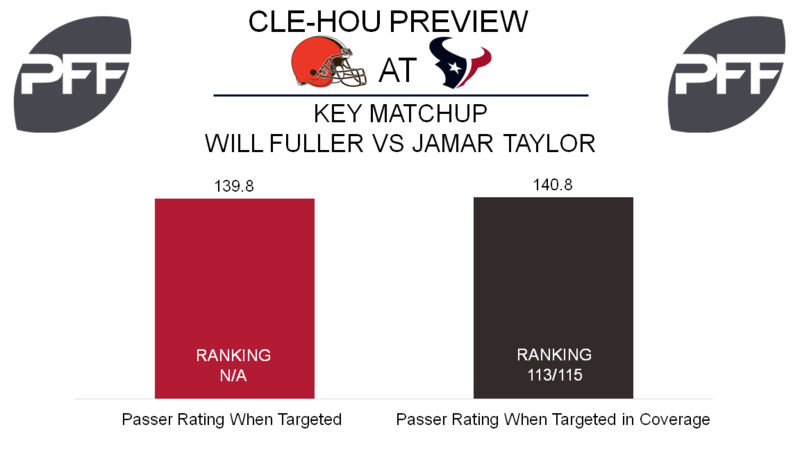 WR Will Fuller vs. CB Jamar Taylor – Targeted nine times since his return from injury, Fuller has made the most of them with a 139.8 passer rating when targeted, which is definitely aided by four touchdowns in that span. Fuller’s big play potential was also on display this past Sunday night, which is important to note when facing Taylor. So far this year Taylor’s passer rating in coverage of 140.8 ranks 113th out of 115 qualifying corners, while his 2.07 yards allowed per coverage snap ranks 109th. With DeAndre Hopkins figuring to see plenty of Jason McCourty, there is a chance Fuller sees more volume than usual this Sunday and it could pay off in a huge way. G Xavier Su’a-Filo vs. DI Larry Ogunjobi – Through five games, this has been a rough season for Su’a-Filo as his overall grade of 38.5 ranks 64th among 74 eligible guards. In run blocking, he ranks 52nd with a grade of 39.7. Despite just one game playing more than 20 snaps, Ogunjobi has made his presence known defending the run. With an overall grade of 80.3, he ranks 33rd among defensive interior linemen while his 82.8 grade against the run ranks 22nd. Few defensive tackles have been able to match Ogunjobi’s efficiency stopping the run so far. His stop percentage of 13.5 percent ranks third among 88 qualifiers. If the Texans look to get Lamar Miller and D’Onta Foreman going on the ground, Su’a-Filo having success against Ogunjobi could help establish the running attack.